Our new EP, the self-produced Fischer Random Chess, is complete and available for purchase at all of our gigs for the low price of $3, about the price of one draught beer from the bar. 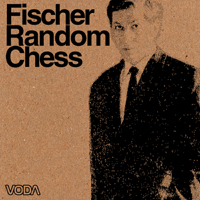 You can also purchase Fischer Random Chess in MP3 from the Voda Store on Vodamusic.com and from Amazon, iTunes, Rhapsody, and Napster. The MP3 album sells for $2.50 and individual tracks cost $0.75 each. If you are interested in purchasing a copy of Fischer Random Chess and cannot get to a Voda show, please contact us and we can accommodate you. Mail-order prices are the same as above, except for a $2 shipping and handling charge. Note: Complimentary promotional copies of Fischer Random Chess are available to media outlets and booking agencies upon request.